I wrote earlier about pricebots gaming Amazon and forcing down the retail price of Lauren Ipsum to $10.76. Now I've come across something even shadier. A fake store that looks better than my own blog, "selling" it for even less than that. I wish I had product shots like that. A site called Geefts ("Gifts for web geeks!") 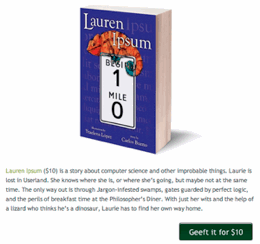 has jumped into the game, pretending to have paperback copies of Lauren Ipsum for only $10. Remember, this is a fairly new print-on-demand book, so where would they get stock? Geefts is also busy spamming Twitter with identical posts from attractive female accounts linking to their "product page". The site is decently designed, even going to the trouble of photoshopping the cover of my book onto some other book. It's all a lie. When you click their "Geeft it for $10" button it just dumps you to Amazon's product page for the book with a completely different price. But having passed along, of course, their affiliate tag so they get a commission for whatever you happen to buy there. I understand marketing your own book, and competing with other people marketing their books. But I'm wasting my time battling bots and spammers that pretend to have copies of my own book. They are playing a numbers game, not caring what happens as long a they get their affiliate fee or shipping & handling charge. All of this is frankly confusing. On one hand it's nice that people are paying attention, and are least hearing about the idea that everyone can and should learn how to program computers. On the other hand, potential readers have to pass through this thicket of deception.